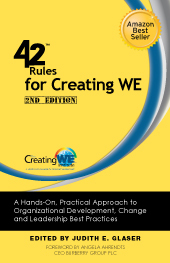 42 Rules for Creating WE (2nd Edition) introduces groundbreaking practices for bringing spirit of WE to an organization. : A hands-on, practical approach to organizational development, change and leadership best practices. Authors that contributed to this book! Currently, most organizations today operate in an �I� paradigm. In this arena, we keep score � �I�ll scratch your back if you scratch mine.� We are taught to control our needs and emotions because they are destructive---logic prevails. We are punished for making mistakes and we hide our thoughts for fear of losing our power or status. In a WE paradigm, things are different. '42 Rules for Creating WE (2nd Edition) ' offers new insights from thought leaders in neuroscience, organizational development, and brand strategy, introducing groundbreaking practices for bringing the spirit of WE to any organization, team or cause. This book is written by The Creating WE Institute, an international group of critical thinkers with multi-disciplinary expertise, who have come together to harvest new forms of engagement and innovation in the workplace. The Creating WE Institute�s mission is bring a spirit of WE to organizations currently operating as a group of I�s. "'42 Rules of Creating We' swims against the tide of egocentrism that does so much harm in this world. The worst answer lies within a person, even worse it lies halfway between us. The ultimate, almost always, is found when great minds meet in a special way. 'The special way' is what it is all about and 42 Rules does it for us." "The biggest untapped lever in business today isn't strategy: it's organization and people development. Moving from 'me' to 'we' is the breakthrough concept. Companies, business leaders, and functional managers will achieve differentiated results by embracing these concepts. '42 Rules for Creating WE' is the playbook." "Whether you're a Special Operations warrior or a corporate warrior, The '42 Rules for Creating WE' can help you inspire your teammates—those you have to lead into battle. An excellent book for warrior-leaders who seek to dominate their chosen battle space." "This compendium of rules to create effective teams provides expert guidance to all in their workplace and personal life. It confirms natural human responses to common workplace actions with recent studies in neuroscience. It is easy to read and even easier to apply. This book is a must read 'now' for everyone in the workforce." "Expressing appreciation, generating cooperation, and fostering an overall healthy and positive work environment are concepts that we all intuitively know to be instrumental to the success of any organization, be it a fortune 500 company or an elementary school. '42 Rules for Creating WE' eloquently transmits the know-how needed to convert this intuition to practical application, allowing leaders to take their organizations to levels which they would have thought unimaginable." "No truer words have been written, especially in today's digital world: 'We are what we write.' From Deborah Dumaine's chapter on 'you' focused writing to other inspired yet practical advice, the team that assembled the 42 Rules did us a great service. They put everything one needs to create a wonderful organization under one cover. Kudos and thanks." "The Creating WE Institute has rediscovered age old wisdom, and has written a book that speaks to everyone. There is no more important than how the I and the WE engage." "Competition has always been a cornerstone of capitalism and the free-market system. The assumption has been that competition is geared towards competitors, not colleagues. This is frequently not the case. Creating organizations aimed at co-operative behavior was a first step but Judith Glaser has taken this concept to a different level. Through this book, she has invited a group of managerial and organizational specialists to share their unique insights into how people in organizations can contribute to effectiveness but also to individual, human fulfillment—while making good money." "Judith has used her 'WE' philosophy to bring us a book which captures the very essence of what she believes in—essential extracts of thought and wisdom from a community of people, across an extensive network. Each page has at least a morsel to savor, some a full meal to digest. You are invited to sit at the table, join in the conversation or take away what you need." "We need WE. We all need this book. '42 Rules for Creating WE' is a beacon, reminding us to steer clear of the dangers, limitations, and false securities of I-centric thinking. Too often we fall blindly into status-quo, me-first, win-lose, and mechanical or hierarchical thinking. Too often we forget that we share common goals and aspirations, and that we are social by nature. Judith Glaser reminds us over and over again that work is social, that community is social, that we are social. WE-centric thinking provides a means by which each of us can exercise our skills and talent in service to shared intent. A WE-centric approach invites participation, calls for individual responsibility and action, and obligates teamwork and cooperation. Isn't this something we all want? We all would do well to embrace the WE-centric perspective. In short, this book is a practical save-me-from-myself-yet-again guide to leading and living. " "A well-arranged smorgasbord of tips and practices, each reliably designed to take your emotional intelligence and leadership effectiveness up a few notches." "'42 Rules for Creating WE' provides simple and usable tools that encourage leaders to live the values of their brand. 'WE-centric' teams speak the same language, and use brand values as a filter for decision-making. Great leaders recognize it takes courage to lead from a WE-centric perspective, yet when they step into a 'WE-state of mind' they discover they are more fully equipped to make tough calls, and use their seat at the table to harness their brand values for 'across-the-board' success." "We work and live in a fast-paced world where the rules keep changing! The '42 Rules for Creating WE' facilitates a much guided and inter-connected path, where we are able to find our humanity and creativity, to successfully navigate our way in the world." A hands-on, practical approach to organizational development, change and leadership best practices. For 200,000 years, human beings have moved back and forth between I-Centric and We-Centric societies. Time and again, we�ve seen the �I to WE� pendulum swing. Yet, history has shown us that societies that prospered, withstood adversity, and created real and lasting advancements understood the power of Creating WE. Each of these concepts contains a set of timeless guidelines, practices and tools for becoming a WE-Centric leader and fostering dramatic improvements in productivity, engagement, and focus. Leaders who have the courage to explore these new concepts will begin to see more productive norms emerge in their organizations. They will see people working together toward common goals, energetically and enthusiastically. And that�s when the real magic happens. 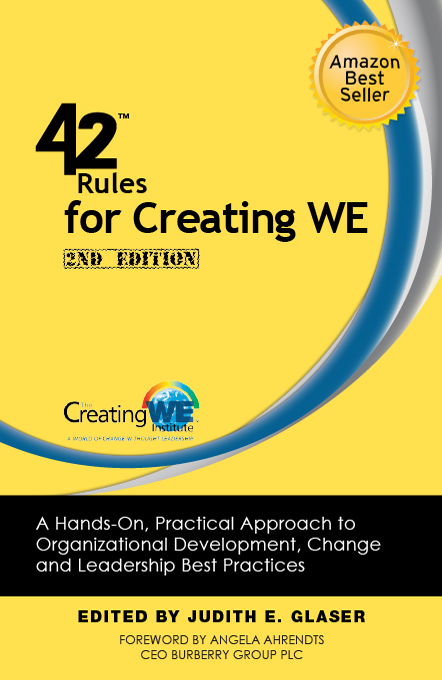 42 Rules for Creating WE (2nd Edition) is written by The Creating WE Institute, an international group of critical thinkers with multi-disciplinary expertise, who have come together to harvest new forms of engagement and innovation in the workplace. The Creating WE Institute�s mission is bring a spirit of WE to organizations currently operating as a group of I�s. 42 Rules of Creating WE for your company? "One of the most pleasing and captivating aspects of music is the ability to identify and bring together sounds that when heard individually would appear lacking and discordant into a beautiful and complete harmony. In '42 Rules for Creating WE,' leaders will learn how to listen for these different sounds and how they can use them to bring about the harmonization of their organization into a beautiful and complete WE." "'42 Rules of Creating We' presents a multi-dimensional philosophy regarding the creation of an organizational context in which profound insights into human nature and interrelationships can be harnessed for greater productivity, success and compatibility. This approach requires the exploration and adoption of concepts that are fundamental to the human condition such as truth, integrity, attitude and sensitivity to others and their ideas." "Even military organizations have to look beyond traditional norms and find ways to be inclusive and imaginative. Creating WE helps readers to tap into that intuitive wisdom we all possess, but have lost sight of in this competitive world." "In her groundbreaking work, Creating We, Judith E. Glaser provides a manual for building high functioning teams by focusing on the human characteristics that most often sabotage our best efforts at getting people to work together. Now through the collaboration of members of The Creating We Institute, she has put together additional recipes for success that provide 42 different insights into building a WE-centric organization. Like a cookbook, the 42 Rules can be read in any order depending on the occasion and background of the reader. You'll find helpful tools for any management style and a wide variety of situations." "To create an environment where people can thrive and succeed is every leader's hope and goal. '42 Rules for Creating WE,' with its down to earth tips and tools, masterfully written by those who have spent decades building WE-Centric environments across the globe, is an immeasurably important contribution towards this end. Leaders will forever be thankful for having read it." "One of the most powerful and profound leadership ideas I've encountered is WE-centric thinking. Fact is, the Gary Cooper go-it-alone heroic model didn't even work in High Noon; he needed Grace Kelly's help to finish off the bad guys! Now, members of The Creating We Institute have written this very accessible book of 42 rules to help everyone shift from I-centric thinking to more inclusive, more productive ways of working and being with others. It is a guidebook to co-creating our futures, worth reading and keeping and reading again." "To paraphrase Victor Hugo, 'Nothing is as powerful as an idea whose time has come.' Judith Glaser and fellow members of The Creating We Institute have created a highly original and thought-provoking book that is a strong affirmation of the power of WE—an idea whose time has come. The authors of '42 Rules for Creating WE' do a great job in demonstrating the power of WE-centric thinking and how it can help us create stronger families, communities, companies and nations." "'42 Rules' is a handy collection of relationship gems—whenever you feel stuck in a relationship and wonder how to get unstuck, pick up this treasure trove and find the gem of insight that provides a roadmap for getting unstuck." "These '42 Rules for Creating WE' supercharge our approach to leadership and provide accessible reminders of how to stay our best and most productive selves while helping those we work with to do the same. The lessons in this book are 'difference makers' and are equally pertinent to both our work and life pursuits." "Everyone talks about thinking outside the box. '42 Rules for Creating WE' gives us a springboard by challenging the old 'do-it-yourself' paradigm and shows how collaboration trumps competition! The stories from a myriad of writers provide a wonderful image of what could be if there was more 'WE.' This book should be given out throughout our educational system so that it is not so foreign when we come into the business setting." "With wisdom that could only have been cultivated and inspired through years of study and experience, '42 Rules for Creating WE' offers the reading audience a pragmatic and accessible guide for optimizing organizational performance and building thriving, WE-centric communities. A must read for leaders everywhere." "This book is a 'must' for corporate, political and academic leaders. Strong productive teams and/or families are founded on respectful collaboration. 42 Rules of Creating WE is a pearl of collective wisdom providing powerful insights in 'how to' uncover those secrets quickly." "The 'creating we' philosophy is a refreshing and candid perspective on how we can live more productive, meaningful and mutually enriching lives, both personally and professionally. The concepts of giving with no expectations of return, exertion of consistently 'positive' energy, true transparency in interactions, and eliminating the 'black/white' or 'right/wrong' approach to perspectives on decision-making, are just a few of the necessary tools for modern organizational success." "Most of us stick hard to our individual viewpoints and don't see the benefits of collectively developing programs and networks. Jane Hewson's approach to consulting—reflected clearly in the tenets of Creating WE institute and the messages from colleagues in 42 Rules—builds consensus and effectively moves the needle for business leaders." "There is nothing more important than building consensus in a healthy and effective way. The viewpoints of The Creating WE institute members, shared in 42 Rules, should be daily touchstones for all of us in leadership positions, no matter what kind of business we are in." "This is a power collection of strategies and techniques to assist anyone who knows the power gained by harnessing the best of people through effective collaboration." "Principled negotiation requires a perspective that moves beyond compromise to a generative type of thinking, creating optimum solutions for all the parties involved. This cannot be accomplished or even conceived without first changing the win/lose mindset which is deeply ingrained in our thoughts about success. In '42 Rules for Creating WE,' the authors share valuable information, experience and best practices for achieving powerful results while at the same time securing the well-being and creative, generative intelligence of people in organizations across the globe. Olympic athletes depend on each other to push the limits of human capability. It is possible that as leaders and organizations commit to WE-centric thinking, we will move beyond the limits of what was previously thought possible in our world." Judith E. Glaser (www.creatingwe.com) is founder and CEO of Benchmark Communications, Inc. a pioneering culture, leadership and brand firm that works with Fortune 100, 500 and private companies. In 2007 Benchmark launched the Creating WE Institute (www.creatingweinstitute.com), a research and consulting partnership that offers clients opportunities to expand WE-centric thinking in their organizations. Ms. Glaser, who calls herself an Organizational Anthropologist, is a sought after keynote speaker, and a renowned executive coach and innovation specialist helping leaders rethink strategies, new products and services, leverage mergers and acquisitions and create new business models that drive profitability and growth. She has published hundreds of articles on strategic leadership and two best selling books, Creating WE: Change I-Thinking to We-Thinking & Build a Healthy Thriving Organization and The DNA of Leadership, selected by both Forbes and Business Book Review as one of the top business books of 2005 and 2006. Creating WE won an AXION Leadership Award in 2008. Ms. Glaser is contributing editor of Executive Excellence magazine and has appeared on dozens of programs, including the NBC Today Show, ABC World News, Fox News, and the Martha Stewart Show, and has been quoted in The New York Times, Wall Street Journal, Crain�s, and the Harvard Management Review, among many publications. She served as an adjunct professor at Wharton and guest speaker at Temple, Kellogg, Harvard, Loyola, University of Chicago, NYU, IIT and others, and is a founding member of The Executive Woman�s Business Forum, and the We Are Family Foundation. Judith graduated from Temple University with degrees in Psychology and Interdisciplinary studies. She was awarded a Research Fellowship Drexel University and received her MS in Human Behavior & Development with courses at Harvard Bales School of Social Relations. She took additional graduate studies in Corporate & Political Communications from Fairfield University. She was awarded Woman of the Year 2004 in NYC and Inducted into the Temple Gallery of Success in 2007.